RiffWorks T4, General Sequencer from Sonoma Wire Works. Sonoma Wire Works has updated the RiffWorks Standard and RiffWorks T4 recording software for Windows and Mac OS X to v2.6.4. Updating from RiffWorks v2.5 to v2.6.4 adds layer dragging, OS and amp modeling software compatibility, and new InstantDrummer content. Drag and drop layers to rearrange, or drag to another riff to copy. Compatible with the most recent OS versions: Windows 7, Vista, XP SP3, Mac OS 10.6, 10.5, 10.4. Compatible with the latest Amp Model plugins: IK Multimedia Amplitube 3, Line 6 Pod Farm 2, Studio Devil Amp Modeller Pro and VGA II, NI Guitar Rig 4, Overloud TH-1, and many more. Additional free InstantDrummer demo content from Discrete Drums and DrumCore is available in the Sonoma Wire Works online store. RiffLink code has been rewritten for much improved speed, performance and reliability. Layer and Riff order is preserved in collaborations. Loading a collaboration shows progress of synchronization with the server. Active Collaborations panel shows a JOIN button in viewable collaborations, and a FULL button while 4 players are actively collaborating. Riff Notes are now saved correctly in collaborations. Importing riffs or songs from locally saved RiffWorks files to RiffLink has been improved. If you become disconnected from RiffLink, warnings are properly given to keep you from adding more content until you reconnect. Streaming of InstantDrummers that you don't own, while collaborating with users who own them, is working better and faster. Saving a Riff locally that includes an InstantDrummer that you own will include the InstantDrummer content and settings locally. Saving a Riff locally that includes an InstantDrummer that you streamed, but do not own, removes the drummer settings and the content is replaced with the demo InstantDrummer. These settings are restored when you purchase the InstantDrummer. Duplicating another person's Riff that contains an InstantDrummer that you do not own will replace the drummer on your computer with the demo drummer. With the release of 2.6.4, earlier versions of RiffWorks can no longer connect to RiffLink. RiffWorks T4 2.6.4 requires a minimal RiffLink service fee. 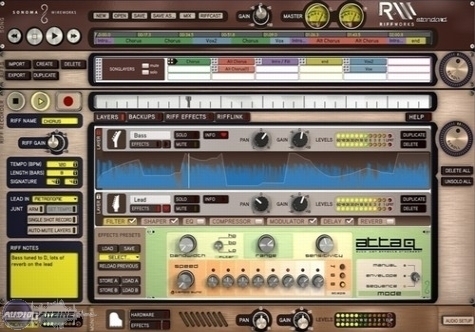 RiffWorks Standard 2.6.4 includes 60 days free RiffLink Service. As of December 17th, 2010, the "60 days free trial of RiffLink" has started for existing RiffWorks Standard owners. For others, the 60 day trial starts from the day you purchase RiffWorks Standard. RiffLink service is now available and priced at $10 for 30 days of RiffLink, or $60 for a year of RiffLink. When you purchase RiffLink, days are added to whatever time you have remaining. For example, if you purchase RiffWorks Standard, then after 50 days have passed in your 60 days free trial, you have 10 days remaining, then you purchase RiffLink 30 days, you'll have 40 days total service at your fingertips. RiffLink service fees are non-refundable. Steve Lawler Dark Percussive House & Techno Dark and Percussive House and Techno weighs in at 1.3GB and includes 1842 separate 24Bit Wav Samples, alongside 100+ Loops at 125 and 127 Bpm which have been looped, acidized and also presented in rex2 format. TeamDNR Ace.Animated TeamDNR Collaborative Designs announces the release of Ace.Animated, a new sound library for u-he Ace synthesizer which combines 225 hybrid dance, trance, club and IDM sounds with patches to give producers, musicians and sound designers a range of sonic possibilities. Audiofanzine Application v1.1 Audiofanzine has released the next version of its iPhone application.